We employ experienced, fully qualified central heating Engineers in Liverpool and surrounding areas. All of our heating engineers have all of the necessary qualifications to be able to work on domestic and commercial central heating systems. We can help you select the right boiler for your property, by considering a range of criteria including price, efficiency, power, physical size etc. We can then order and install the boiler, fully testing the installation to make sure that it’s safe and working fully to effectively heat your home and provide hot water. Will you remove my old boiler? 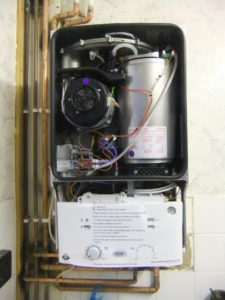 Of course, your old boiler can be safely disabled and removed before the new one is installed. When installing a new boiler into an existing system, we strongly recommend having a power flush. This removes sludge and rust circulating in the system. The warranty on your new boiler may be void unless this is done. At the very least, a chemical flush is necessary, which we do for every boiler installation. As well as installing a new boiler, we can also design and install a full central heating system. If you like to give direction, we can work with you to determine the best radiator location and size/shape. Or if you’d prefer to leave us to it, that’s fine too. We’ll get started and shouldn’t have to bother you until your new central heating system is fully installed and working correctly.